Annual competition honors organizations building outstanding applications and integrations on top of Relativity and extending the platform to address practice management needs. 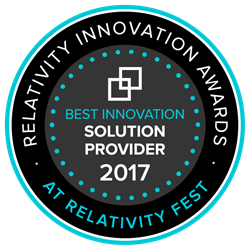 H5, a leading provider of eDiscovery and technology-assisted review services, announced today that the company’s H5 Matter Intelligence solution has been awarded Relativity’s 2017 Innovation Award in the category of Best Innovation: Solution Provider. H5 Matter Intelligence is a multi-faceted application that provides Relativity users a powerful suite of dynamic tools to help maximize their eDiscovery hosting experience. Comprising modules for billing and resource management, internal and cross-organization collaboration, and infrastructure monitoring for IaaS clients, the solution provides extensive real-time visibility into hosted matters for maximum knowledge and project control. Customizable, automated notifications and reporting provide timely intelligence for ongoing project oversight so that users can take immediate action to keep their matters on track. The Relativity Innovation Awards is an annual competition celebrating organizations that use Relativity in creative ways, solving difficult or unique challenges within and outside of e-discovery. Relativity announced the winners during a special ceremony at Relativity Fest, the annual e-discovery conference that was held October 22-25 in Chicago. This three-day event brought together nearly 2,000 attendees from around the world to engage in panel discussions, hands-on labs, breakout sessions, and insights from both Relativity team members and end users. H5 is a leading provider of eDiscovery and technology-assisted review services. We are dedicated to finding information that our clients need to win cases, meet regulatory requirements and address risks before they become liabilities. By combining advanced technologies with expertise in search and information analysis, we deliver customized solutions to help corporations and law firms meet their litigation discovery, legal compliance and information management objectives. With expertise in all aspects of the eDiscovery process, we excel at managing and delivering processing, hosting and related services and have recently expanded our offerings to include Relativity-integrated products for use by our Relativity-hosting client base. Please contact info(at)h5(dot)com for more information or visit our website at http://www.h5.com. At Relativity, we make software to help users organize data, discover the truth, and act on it. Our e-discovery platform is used by more than 13,000 organizations around the world – in the cloud, on-premises, or both – to manage large volumes of data and quickly identify key issues during litigation, internal investigations, and compliance projects. Relativity has over 160,000 active users in 40+ countries from organizations including the U.S. Department of Justice, more than 70 Fortune 100 companies, and 199 of the Am Law 200. As a platform, Relativity also allows developers to design, build, and integrate applications that extend its functionality. Relativity has been named one of Chicago's Top Workplaces by the Chicago Tribune for six consecutive years. Please contact Relativity at sales(at)relativity(dot)com or visit http://www.relativity.com for more information.